The Liturgy Commission helps guide how the parish community worships and celebrates the Liturgy. In collaboration with the Pastor, the Liturgy Commission plans the seasons and feasts of the Church’s Liturgical Year, sacramental celebrations, and other liturgical events. If you would like more information concerning this commission, please call Deacon Mike or Karen Waninger at (812) 362-8726. In consultation with the Liturgy Commission, the Decorating Committee plans and executes the art and environment for the major seasons and feasts of the Church year. 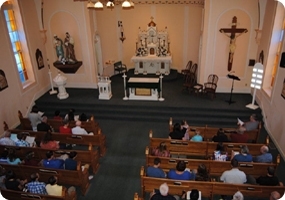 It also strives to produce a pleasing and prayerful atmosphere through the worship space during other times of the year as well. For more information contact Karen Waninger at (812) 362-8726. Here at St. Martin we are proud of our choir, cantors and instrumentalists. The Adult Choir sings at Christmas and on special occasions. Cantors sing at the 9:00 a.m. Sunday Mass and on Holy Days of Obligation, as well as other special occasions. We are currently looking into forming a Children’s Choir and could use more instrumentalists. If you would like to know more about, or would like to become a part of this fun-filled ministry, please contact Karen Waninger at (812) 362-8726. “I don’t get anything out of Mass.” “Mass is boring!” Have you or your children thought or said this? If so, this is your chance to change this feeling! Please contact Deacon Mike Waninger at (812) 362-8726 for more information on becoming a Liturgical Minister.